Disruptions to brain development associated with shortened gestation place individuals at risk for the development of behavioral and psychological dysfunction throughout the lifespan. The purpose of the present study was to determine if the benefit for brain development conferred by increased gestational length exists on a continuum across the gestational age spectrum among healthy children with a stable neonatal course. Neurodevelopment was evaluated with structural magnetic resonance imaging in 100 healthy right-handed 6- to 10-year-old children born between 28 and 41 gestational weeks with a stable neonatal course. Data indicate that a longer gestational period confers an advantage for neurodevelopment. 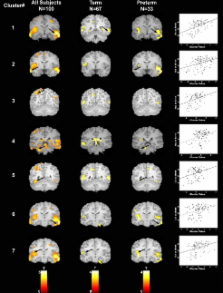 Longer duration of gestation was associated with region-specific increases in gray matter density. Further, the benefit of longer gestation for brain development was present even when only children born full term were considered. These findings demonstrate that even modest decreases in the duration of gestation can exert profound and lasting effects on neurodevelopment for both term and preterm infants and may contribute to long-term risk for health and disease. At its simplest, voxel-based morphometry (VBM) involves a voxel-wise comparison of the local concentration of gray matter between two groups of subjects. The procedure is relatively straightforward and involves spatially normalizing high-resolution images from all the subjects in the study into the same stereotactic space. This is followed by segmenting the gray matter from the spatially normalized images and smoothing the gray-matter segments. Voxel-wise parametric statistical tests which compare the smoothed gray-matter images from the two groups are performed. Corrections for multiple comparisons are made using the theory of Gaussian random fields. This paper describes the steps involved in VBM, with particular emphasis on segmenting gray matter from MR images with nonuniformity artifact. We provide evaluations of the assumptions that underpin the method, including the accuracy of the segmentation and the assumptions made about the statistical distribution of the data. Copyright 2000 Academic Press. This article was submitted to Frontiers in Developmental Psychology, a specialty of Frontiers in Psychology. Copyright statement: Copyright © 2011 Davis, Buss, Muftuler, Head, Hasso, Wing, Hobel and Sandman. This is an open-access article subject to an exclusive license agreement between the authors and Frontiers Media SA, which permits unrestricted use, distribution, and reproduction in any medium, provided the original authors and source are credited. Long-lasting reflux episodes in gastroesophageal reflux and its complications in children. Unrecognised hypoglycaemia in children and adolescents with type 1 diabetes using the continuous glucose monitoring system: prevalence and contributors.